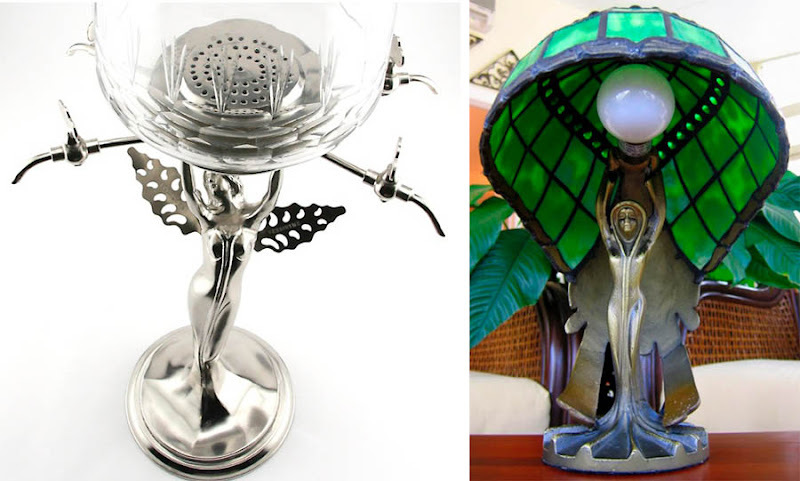 Absinthiana are the trappings and accessories associated with the drinking of absinthe. This anise-flavoured spirit is made from the flowers and leaves of wormwood, green anise, sweet fennel and other herbs. 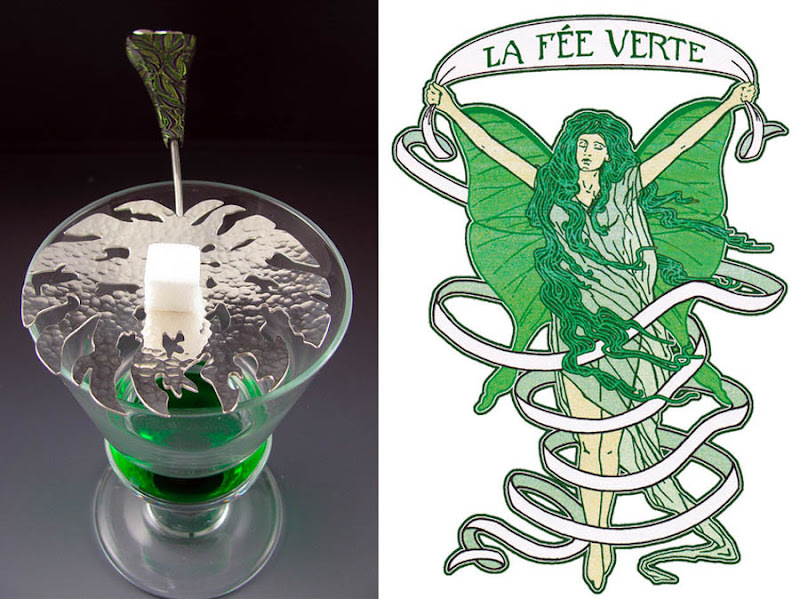 Absinthe has a natural green colour and was referred to as the Green Fairy, although it can also be colourless. Absinthe has a high alcohol level and is normally diluted with water for drinking. It’s also very bitter and was often poured into a glass of water over sugar on a perforated spoon. 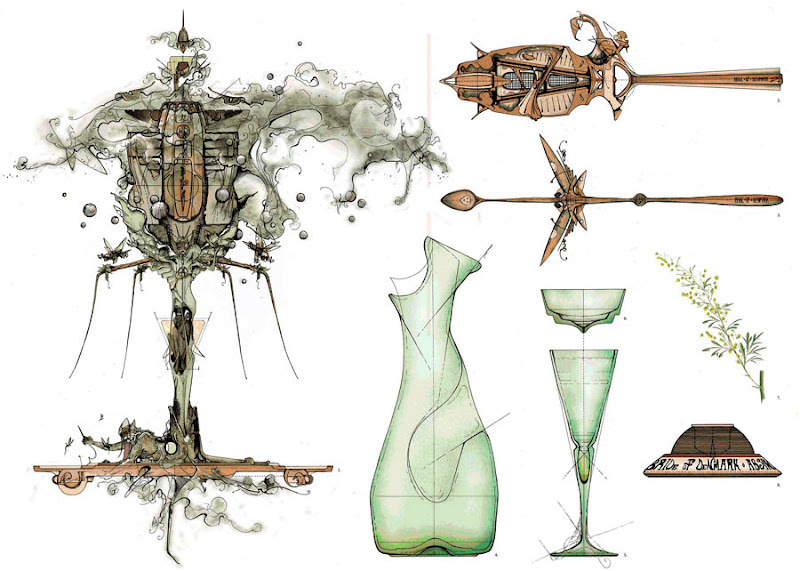 Absinthe was invented in 1797 and by the 1850’s it had become a firm favourite with the upper classes. 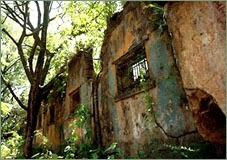 It was originally a wine-based drink, but the Great French Wine Blight of the mid-19th century destroyed many of the French vineyards. 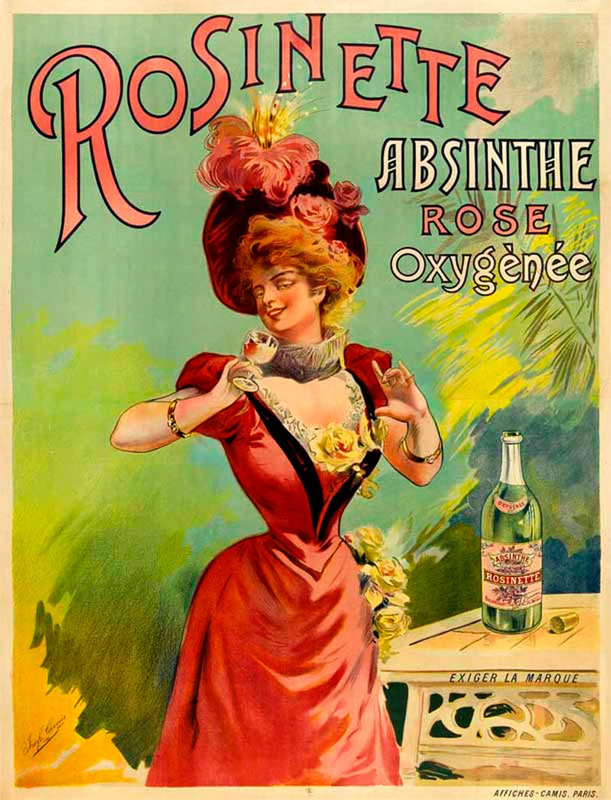 Absinthe was based instead on grain alcohol. 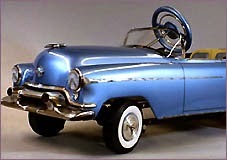 This made it more affordable and the Green Fairy became very popular as an alcoholic drink in France in the late 19th and early 20th centuries. In the early eighteenth century, absinthe would be served in an ordinary glass, with water added from a standard jug or similar container. 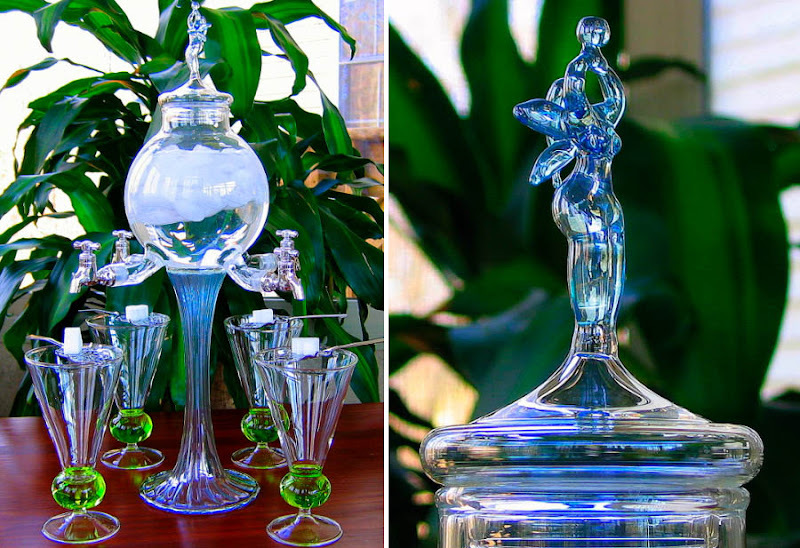 With the increasing popularity of absinthe, specialty glassware, elaborate spoons, carafes and fountains made their appearance. 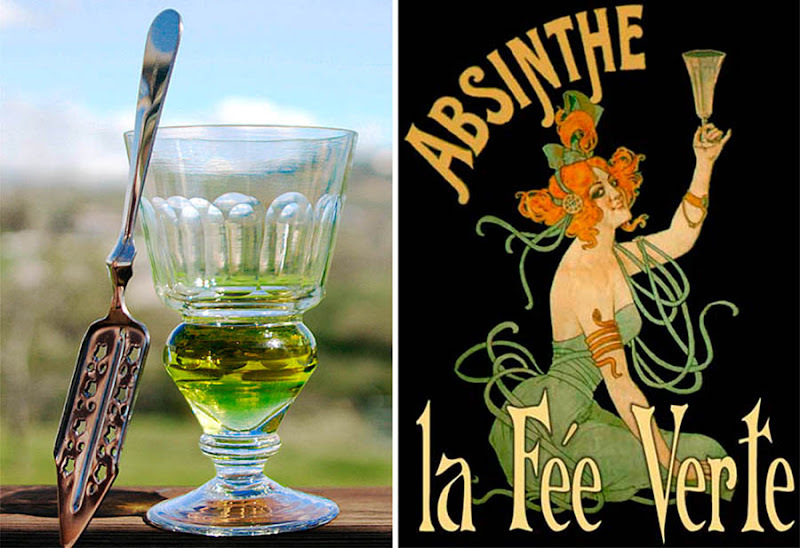 Absinthe was said to be both a narcotic and an aphrodisiac. 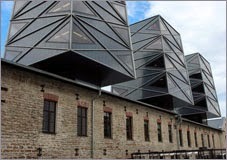 It was adopted by the bohemian culture and Parisian authors and artists claimed that absinthe stimulated creativity. Well-known absinthe drinkers include Vincent van Gogh, Oscar Wilde, Ernest Hemingway, Charles Baudelaire and Henri de Toulouse-Lautrec. 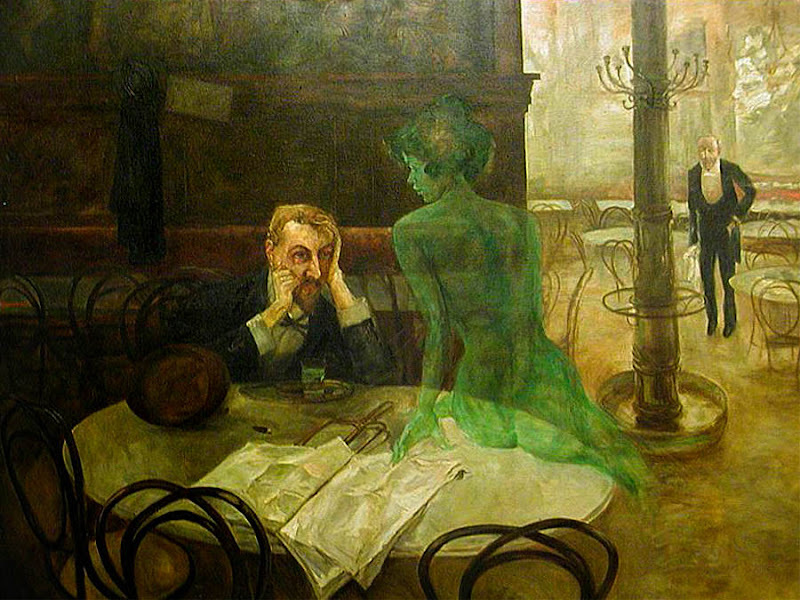 Green Muse by Albert Maignan from 1895 shows a poet succumbing to the dubious charms of the green fairy. 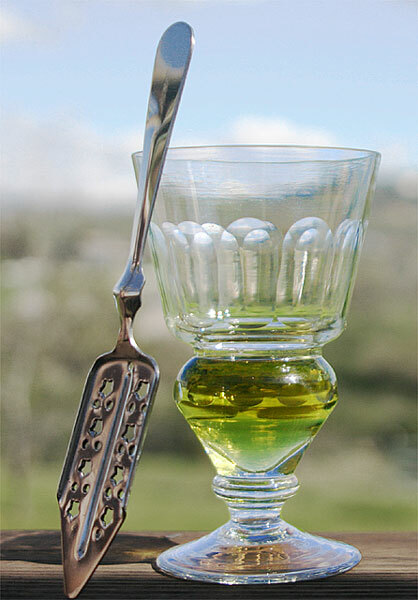 The slotted or perforated spoon was used to dissolve a sugar cube in a glass of absinthe. This helped to sweeten the mildly bitter liquid. 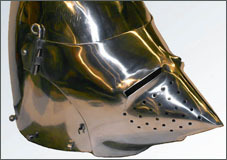 The bowl of the spoon is flat and can rest on the rim of the glass, by means of a notch in the handle. 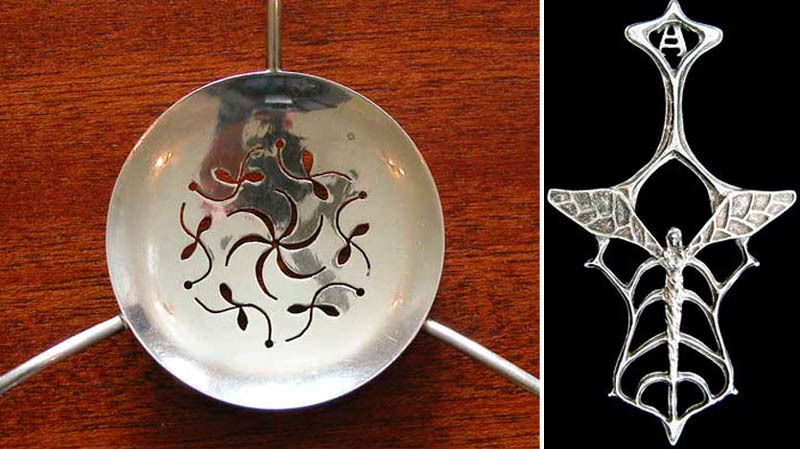 Another absinthe tool was grille, a perforated metal saucer with small legs that suspended it over the glass (right image above). 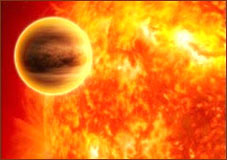 Adding ice-cold water to absinthe causes the liquid to become cloudy, a process known as the “louche” or the ouzo effect in different types of drinks. 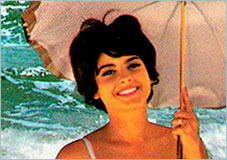 The adding of the water in exactly the right way was considered almost as an art form. 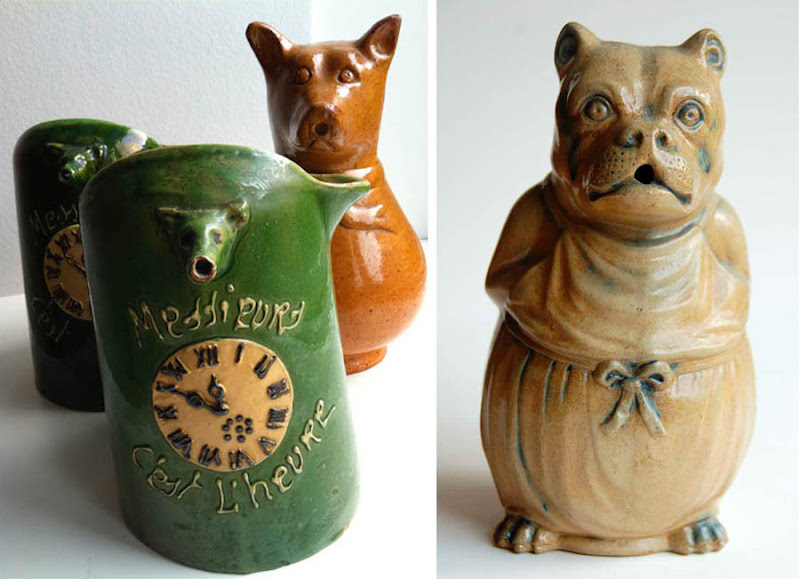 Some establishments had specialists on hand to show new absinthe drinkers how to delicately add the water, one careful drop at a time, from a carafe or pitcher. 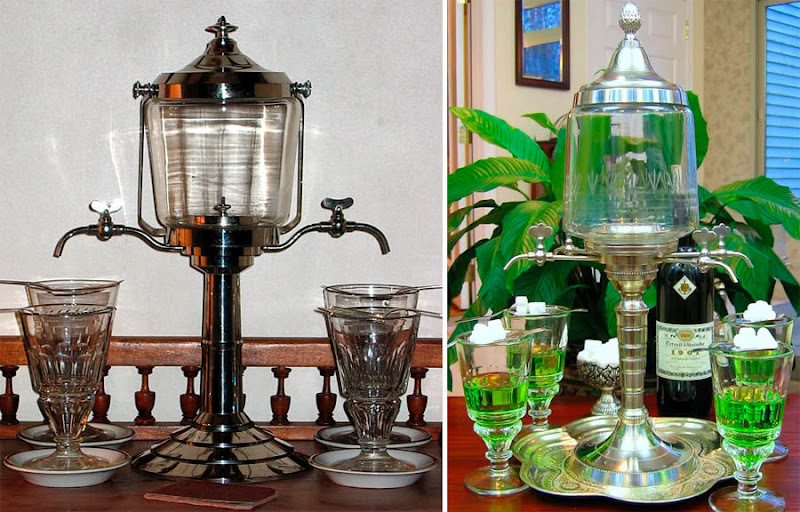 Absinthe fountains also became popular. 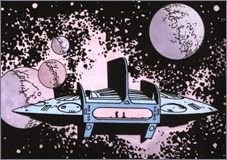 A large glass container with between two and six spigots was suspended above the table. A small group of drinkers could prepare their absinthe all at the same time, with a slow drip of cold water, rather than having to really focus on getting the droplet exactly right when poured from a carafe. 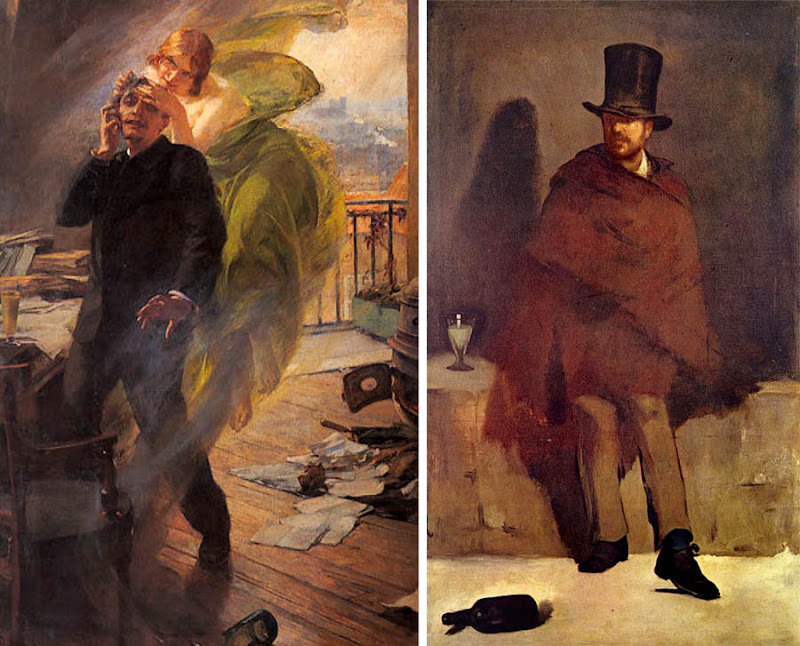 Chronic use of the spirit was said to lead to absinthism, which was widely believed to cause addiction and even hallucinations. 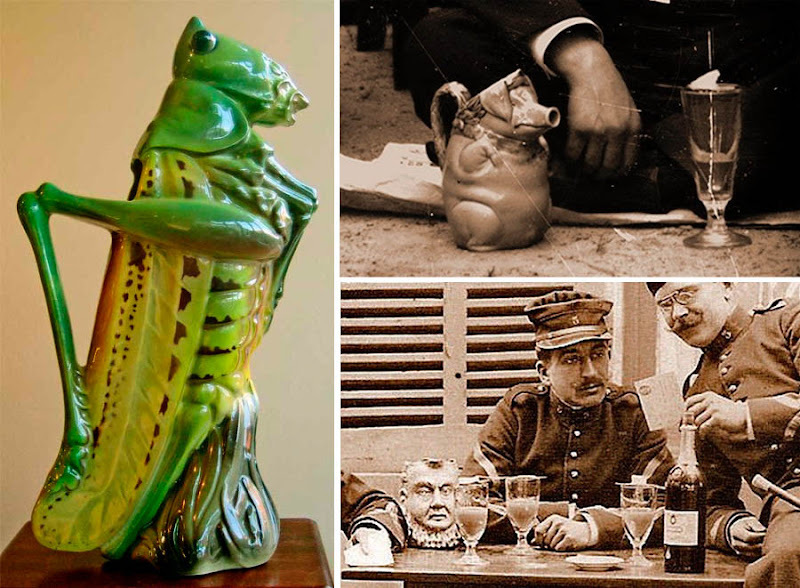 Considered to be a leading source of numerous social evils and a general menace to modern society, absinthe was banned in many countries just prior to World War I, including the United States in 1912 and even France itself, the home of absinthe, in 1914. 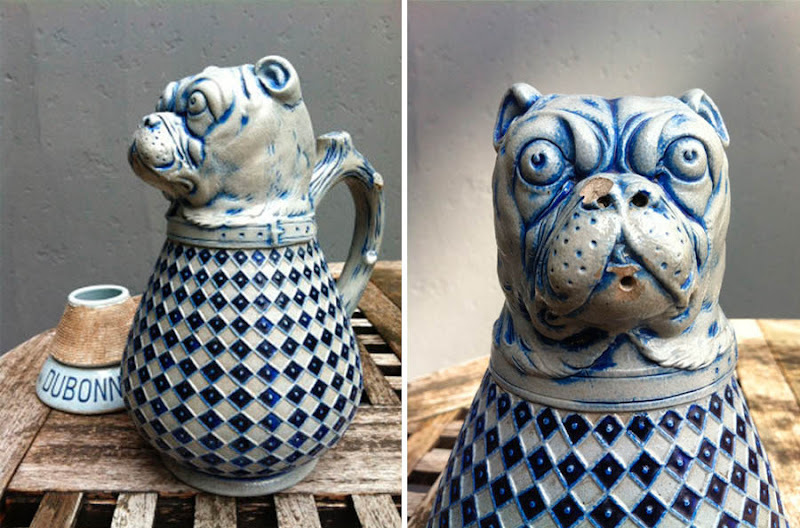 This lead to the popularity in France of other anise-flavoured spirits devoid of wormwood, such as pastis and ouzo. After World War I, the Pernod Fils brand was still produced in Spain, which had not banned absinthe, but production stopped in the 1960s. In Switzerland, absinthe production went underground, with people distilling the drink at home as a colourless drink, which was much easier to keep secret from the powers that be. 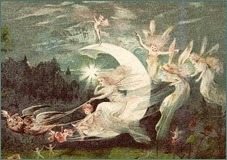 The fabled Green Fairy had never been banned in the UK and in the 1990s became popular when absinthe was imported from the Czech Republic. 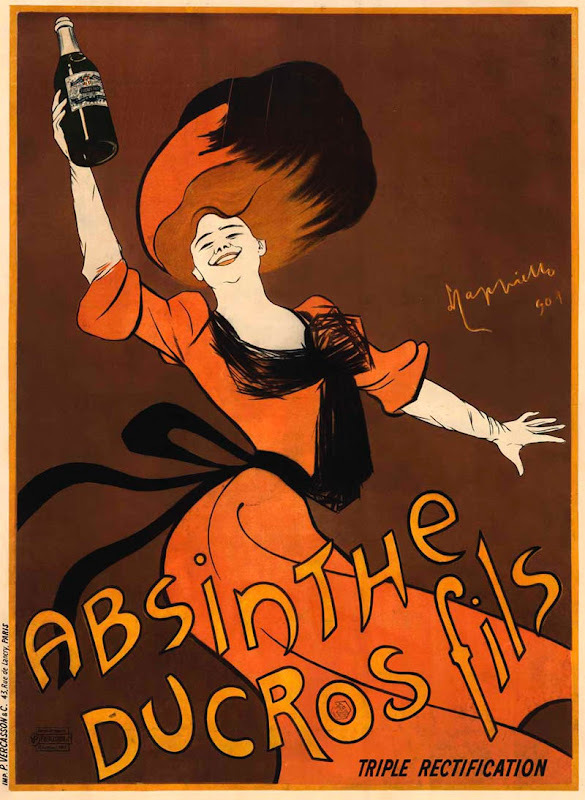 Other absinthes were made in Spain and Portugal, although true connoisseurs weren’t impressed, since they felt the modern versions simply weren’t the same as the classic drink from absinthe’s golden era. 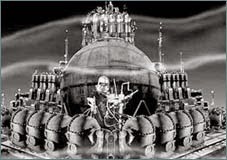 In 2000, commercial absinthe was finally distilled and bottled in France for the first time since 1914 and there are now numerous different brands to choose from. 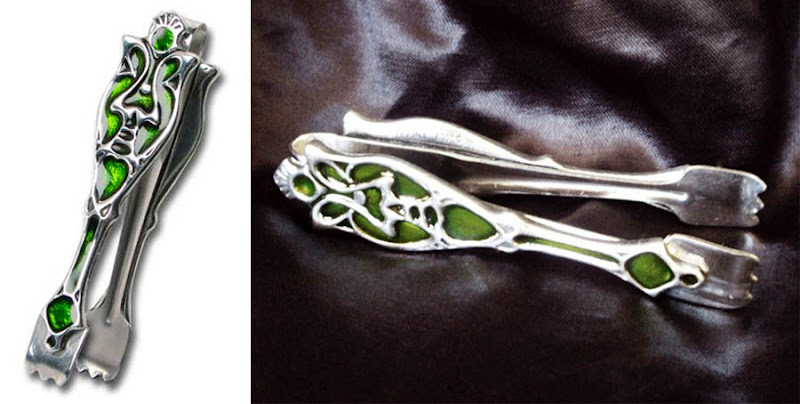 Older absinthe spoons were often beautifully designed. 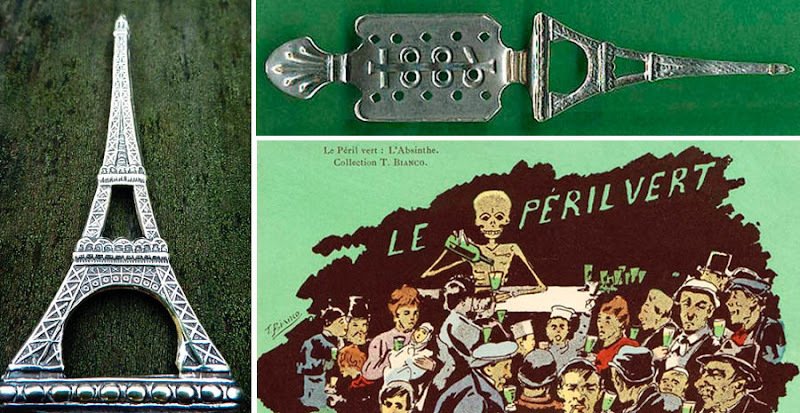 With the modern revival, distillers are also producing interesting designs for absinthe accessories, some for the purposes of advertising and promotion of particular brands. 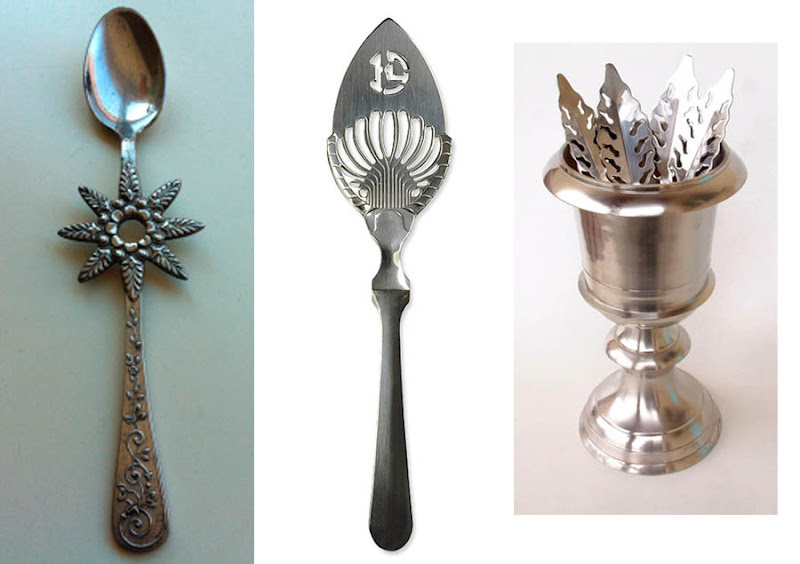 Need somewhere to keep your absinthe spoon collection? 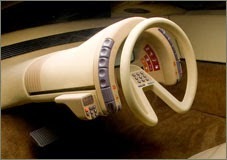 How about this very nice spoon holder (right image above)? This is apparently a faithful replica of the type of bar accessories that were popular during the golden era of absinthe drinking in the late 19th and early 20th centuries. 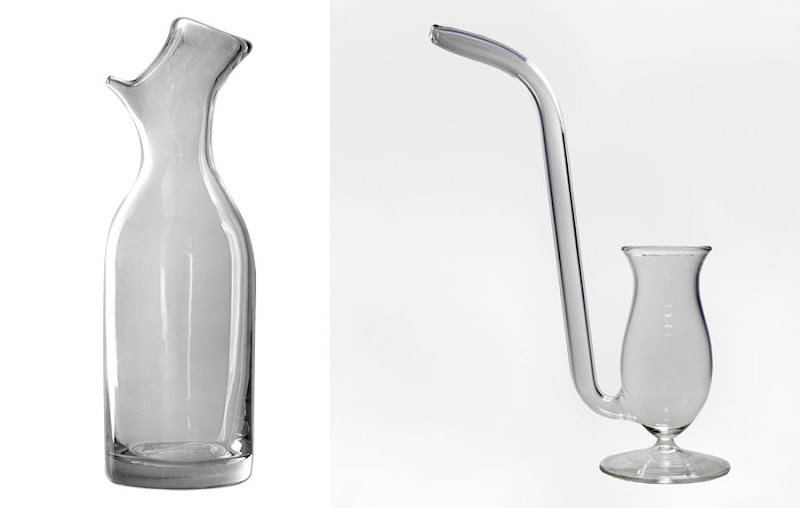 Absinthe pipes offer an alternative way to drink your absinthe (right image above). Aficionados of this method drop some crushed ice in the bottom of the glass, then add the absinthe, before sipping the drink through the glass tube.